EQuIS Professional data libraries provide a variety of advanced Electronic Data Deliverables (EDD) formats and applications. EQuIS Professional PlusD Library provides EDD formats, interfaces and reports for several common North American and international, state, and federal agencies. The PlusD Library requires Enterprise Silver or higher. Several EQuIS EDD formats are bundled with EQuIS Schema tables for data management and exports to Microsoft Excel, Microsoft Access, SQL Server, Adobe PDF, XML, ESRI SHP, Google Earth KMZ, TXT files, and other common exports. 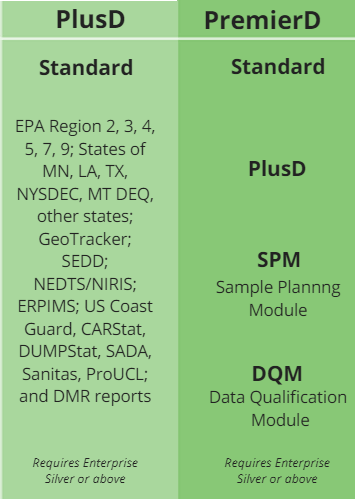 EQuIS supports a variety of exports including NEDTS/NIRIS, DIGGS, AGS, ERPIMS, GeoTracker, NJ Hazsite, NYSDEC, MT DEQ, Scribe, SEDD, US Coast Guard, CARStat, DUMPStat, SADA, Sanitas, ProUCL, and others. EQuIS exports to several US state Discharge Monitoring Report (DMR) and NetDMR reports. EQuIS Professional PremierD library builds on PlusD, and adds the EQuIS Sample Planning Module (SPM) and Data Qualification Module (DQM). The PremierD library requires Enterprise Silver or higher. SPM improves data collection activities with planning, management and tracking capabilities. 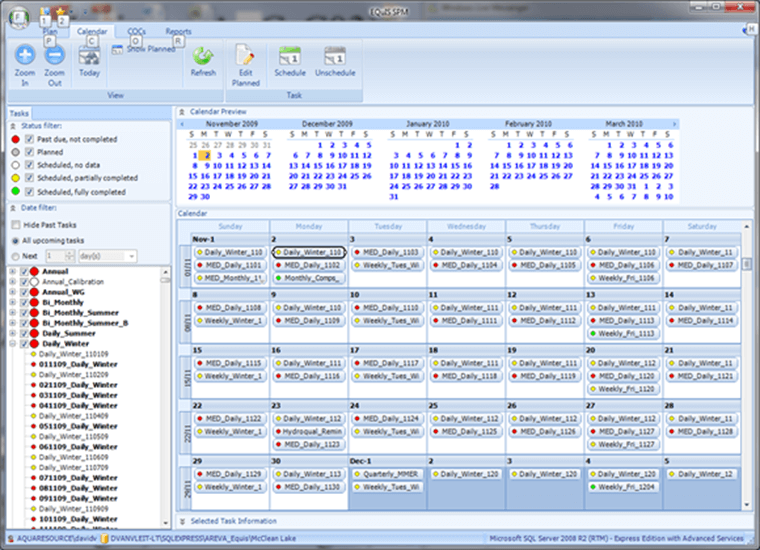 SPM plans unique or repetitive events and tasks, compares planned events on a calendar to actual activities and tracks completeness. 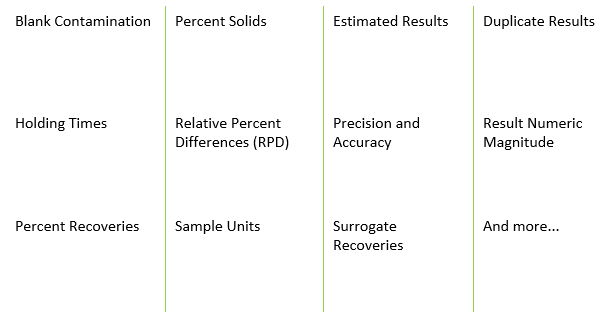 DQM supports data validation, ensuring sample data meet established data quality criteria. DQM creates data validation events and event processing allows data qualifiers to be applied in batch. These events can be saved and re-opened as needed. Data quality reports are available via Enterprise. The DQM qualification events are used to correct and modify reported laboratory data. All available EDD formats, data Interfaces and exports, and interfaces to most third-party visualization applications. All available EDD formats, data interfaces and exports, SPM, DQM, and all available interfaces to third party visualization applications (including ArcGIS and AutoCAD).